Navy blue silk georgette one-piece dress; with appliqué of matching material in front bodice, with belt, double-layered back skirt. 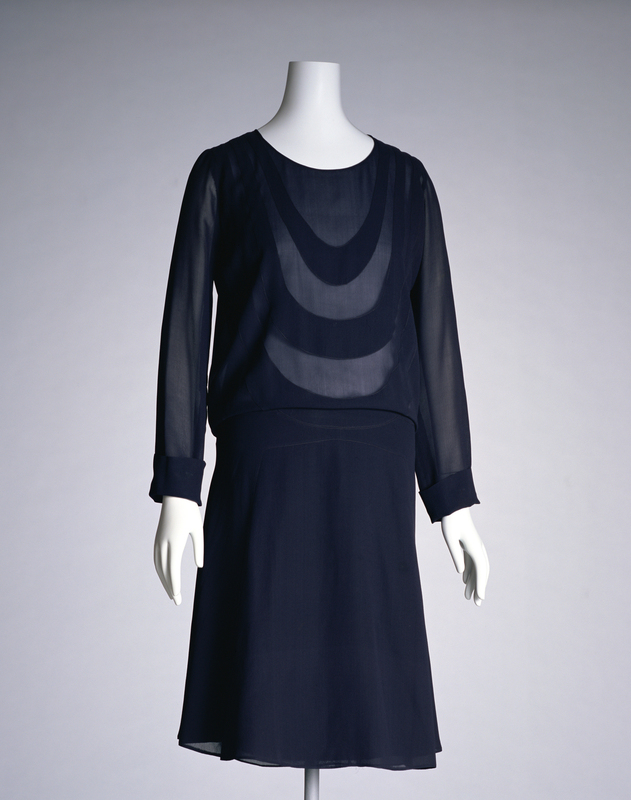 This simple, tubular one-piece dress is representative of the 1920s. The prominent feature of this dress is the half-moon/crescent moon appliqué on the sheer georgette of the bodice. It is one of earliest reflections of the Art Deco style. When the "International Exposition of Modern Industrial and Decorative Arts" was held in Paris in 1925, its influence spread widely throughout the decorative arts, including haute couture, which was entering its golden age. Hemlines, which had been becoming shorter year by year since 1920, had already reached knee-length with this 1926 dress. Once the sash belts sewn on the sides of the dress are tied together to blouse the bodice, the waistline and the hemline gain the horizontal line. Although she began her carrier before World War I, Gabrielle Chanel established her name in Paris haute couture after the war as the leader of the major shift in the direction of women's fashion towards modernity, when women sought a new, active image. Chanel did away with the excessive decoration of traditional fashion, instead exploring the kind of modern decoration that can be seen in this dress, which could be described as luxurious as a result of being pared down. More than anything, her creations were appreciated for being both functional and comfortable. This particular dress was formerly owned by the French fashion leader of that time, Princesse de Faucigny-Lucinge (1902-1945).